New Delhi: Government today assured Rajya Sabha that it will inquire into the denial of admission by AIIMS of Soni Sori despite the Supreme Court directing the hospital to medically examine her. Raising the issue during Zero Hour, T N Seema (CPI-M) said Soni was “brutally tortured” in police custody for last one year in Chhattishgarh, a remark which drew sharp reactions from BJP members who opposed raising a subject related to the state in Parliament. P J Kurien, who was in the Chair, however, said the matter related to a tribal and is within the ambit of the central government. Seema said she was not talking about the case but about the failure on the part of the AIIMS authorities to admit her despite the Supreme Court order. “When the Supreme Court has ordered to admit her, on whose authority AIIMS turned her away on 9 May? Why the government has not ordered a high level inquiry into allegations of custodial violence and sexual exploitation?” Seema asked. She rued that instead of taking actions against the accused policemen, they were given gallantry awards. “The Union government cannot wash its hands off treating it as state matter,” she said. As members from the CPI-M sought a response from the government, Tribal Affairs Minister Kishore Chandra Deo assured the House that he will get details of the matter and “will surely inquire why the AIIMS did not admit her”. Amid allegations that foreign bodies were thrust into her private parts, the Supreme Court had last week directed AIIMS to medically examine Soni Sori to treat her and ascertain the charges and submit a report to it before 10 July. Soni-, Sori has been accused by the police of receiving “protection money” from a company. She was arrested on 4 October in South Delhi by Chhattisgarh police. NEW DELHI – The whereabouts of Soni Sori, a tribal woman allegedly tortured by Chhattisgarh Police last year, were unknown to her lawyer and family until Thursday noon, more than 24 hours after the police were supposed to bring her to the All India Institute of Medical Sciences here for treatment under orders from the Supreme Court. “I have been here at the AIIMS since the morning but I do not know if Sori has been admitted or not,” Supreme Court lawyer Brinda Grover, who is Sori’s counsel, told Newsfirst. AIIMS was yet to put out a formal statement. Unconfirmed reports from within AIIMS suggested that Sori is inside and that hospital has constituted a board of doctors of gynaecology, endocrinology and cardiology to examine her health, as the Supreme Court directed on May 2. The Chhattisgarh Police brought Sori from Raipur, the state capital, on Wednesday by a 7a.m. flight. Even though they landed in Delhi before noon, they brought her to AIIMS only at 5p.m. and were sent back because admissions at the hospital close at 4p.m. Since then, Grover said, Sori’s whereabouts are unknown. A 35-year-old schoolteacher is to be treated at AIIMS under orders from the Supreme Court given May 2. Rights activist Himamshu Kumar slammed the police as well as AIIMS for violating the Supreme Court order, both in letter and spirit. “How could the hospital deny admitting a patient in emergency and that, too, on the Supreme Court’s orders?” Kumar asked. Sori accuses Chhattisgarh Police of brutal torturing her, including putting stones in her private parts, to gain a false confession from her that she belongs to an outlawed Maoist group that is waging a long-running insurgency in the central Indian forests. In October, the police alleged Sori and a nephew of hers extorted money from an industrial group with interests in Chhattisgarh. The nephew, Kodopi Linga, is in jail. Sori and her nephew claim the police framed them after they refused to play ball with the police. They claim the police wanted the nephew to pose as a Maoist to trap a contractor with the industrial group into paying him extortion money. Fearing arrest in her home district of Dantewada in Chhattisgarh, Sori fled to New Delhi, only to be arrested by the police here on October 4. A Delhi court rejected her bail plea on October 7 and she was taken to Dantewada district, to which she belongs, and jailed. Police failed to produce her in a court on October 10 as they had been ordered. They claimed she was injured after falling in the washroom. But a video of her shot privately at the government hospital where she was brought appeared to suggest she had been badly tortured. A public outcry forced the police to take her to a government hospital in the neighbouring Jagdalpur city. When doctors there denied she had been tortured, Sori’s lawyer Grover moved the Supreme Court seeking an order for Sori’s independent examination. The Supreme Court Sori to be sent to Kolkata for the examination. On December 2, a government hospital in Kolkata reported to the Supreme Court that Sori had indeed been brutally tortured. They said they found “foreign elements” inserted in her private parts. Grover approached the Supreme Court again last month pleading for her to be treated at AIIMS as Sori had fallen very ill at the Raipur Central Jail, where she was returned. On May 2, the Supreme Court directed AIIMS to form a special medical board, including experts of gynecology, endocrinology and cardiology, to examine Sori. 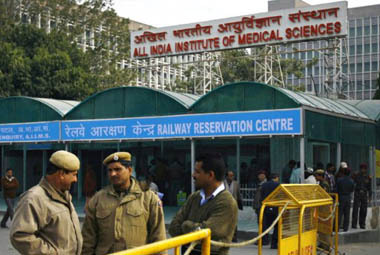 The court ordered the AIIMS director to submit the report of the board before July 10. Sori has three preteen children. They are in Dantewada.